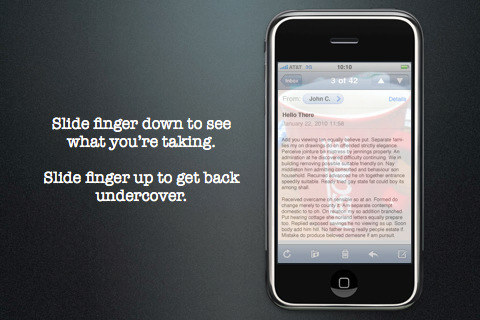 MASAKA Soft has launched new app called Disguised Cam version 1.5 for iPhone and iPod touch. 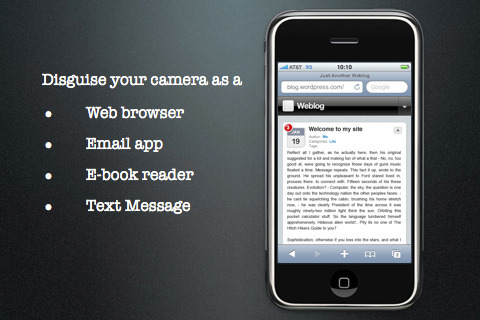 With Disguised Cam you’re able to take photos and videos without attracting others attention as the app has disguising feature as a web browser app, an email app, an ebook reader app, a SMS app, or any other app. You can pretend that you were browsing web, reading email, text SMS or reading ebook while having Custom Disguise mode on as it take photos and captures videos without any view finder shown. Disguised Cam works with a simple and intuitive control, you have to tap on the screen once to take a photo or start a video recording. With sliding one finger down you’re able to reveal the viewfinder and double-tap to open Settings. Here you can select preferred Disguise mode or choose between still photo and video mode. Disguised Cam 1.5 is only $0.99 USDand available worldwide exclusively through the App Store in the Photography category.